A considerable amount of the information in the following report is taken from a ‘dissertation’ submitted for the degree of MSc (Regional and Urban Planning) at the University of Reading, by Mr Mark Wright Davies on 30th September, 1975. When Mr Davies wrote the dissertation, the gas tank battle was ongoing and so additional details of the completion of the ‘battle’ have been obtained from local people and press coverage. Anybody wishing to learn more in-depth information about the technical and political analysis of the story would do well to view this book which is held in the Reference Section of Aberdare Library. Mr Davies compares the ‘battle’ between the Hirwaun ActionCommittee and the British Gas Council to that of David and Goliath. He says the Action Committee ignored the verdict of the public inquiry and blatantly and illegally forced the Gas Council(now the British Gas Council) to withdraw. Having won the inquiry, the Gas Council had, no doubt, expected local opposition to abide by the usual rules of the planning game and fade away, but, the villagers refused to acknowledge defeat. As far as they were concerned their arguments were still valid. The constitutional machinery at their disposal had proven ineffective in forestalling the development and so it was now necessary to resort to other kinds of defensive action. This took the form of civil disobedience and the forging of new links with local trade unions. In 1970, the then Gas Council (since 1972, the British Gas Corporation) decided it would need LNG (Liquefied Natural Gas) storage near the end of the Bacton to South Wales pipeline. After considering some two dozen sites along the pipeline, the Gas Council scrapped its first choice at Llandarcy in favour of the Hirwaun site. Their plan was to build two giant storage tanks at the foot of the Rhigos mountain within close proximity to the village of Hirwaun and adjacent to the main Hirwaun to Swansea trunk road. Aberdare Urban District Council had no legal say in the planning decision because the actual site fell within the boundaries of Neath Rural District Council and it was Neath who had given planning permission to the Gas Council without informing the local and county councils that bordered the Hirwaun site. (Shortly afterwards boundaries were changed and the site of the proposed gas tanks came under the jurisdiction of Aberdare Urban District Council). In November 1970, The Aberdare Leader broke the news of the proposed gas tank development at Hirwaun although Aberdare Urban District Council had been informed in July, 1970. In March, 1971, Aberdare Urban District Council ‘consultants’ report was published and on the 21st April, 1971, Aberdare Urban District Council lodged a formal complaint against the proposal and in September, 1971, the Secretary of State, Mr Peter Thomas, ordered a public inquiry which was held at the Town Hall in Aberdare. 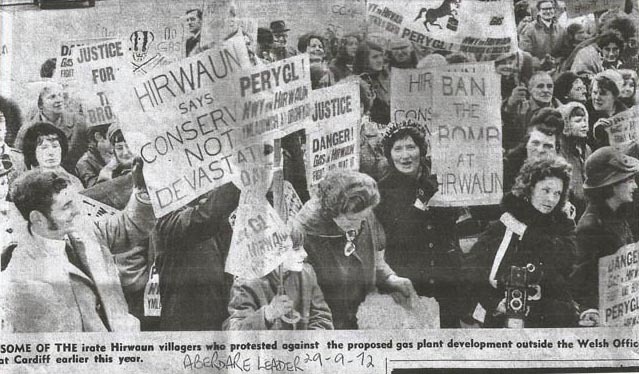 The Hirwaun villagers, in the meantime, had been disturbed by reports that LNG plants were dangerous and in December, 1971 the local labour party convened a well attended public meeting in the junior school at Hirwaun where it was unanimously agreed by the attendees to oppose the citing of the storage tanks in Hirwaun. An Action Committee of 20 members was elected and they decided to fight alongside but independent of Aberdare Urban District Council. Headmaster of Rhigos Primary School, Mr Aubrey Morgan, was elected as Chairman of the Action Committee and Mrs Margaret Drew, secretary. 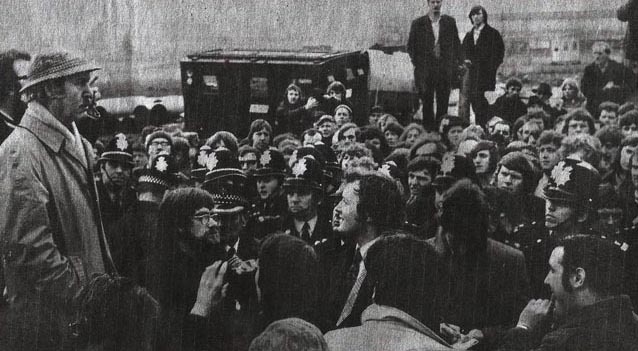 The public inquiry ended in February, 1972 but the result wasn’t published until the 18th September, 1972; the result going against the protesters. In the meantime, the Action Committee started organising car stickers and window posters. They also organised a motorcade of some 100 cars to travel through Aberdare. Several marches were organised, one of them to the Welsh Office in Cardiff where they handed in a bilingual petition and despite the result of the inquiry a newsletter was circulated by the Committee with the message “THE FIGHT GOES ON“. Aberdare Urban District Council had decided to part company with the Action Committee at this point for it was reluctant to prevent the force of law from operating. In May/early June, 1973, the contractors for the first phase, Ernest Ireland of Bath, had commenced work on the site. 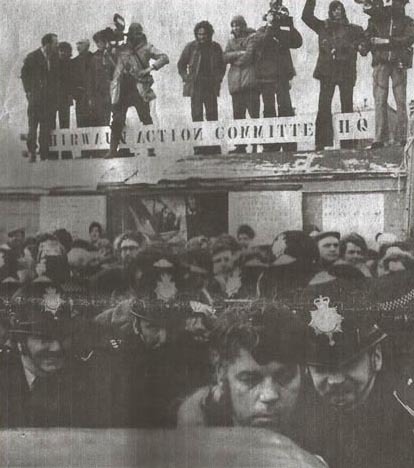 The Hirwaun Action Committee, at this point, were considering all kinds of civil disobedience but were rescued from their indecisiveness by the Aberdare Trades Council’s suggestion that they treat the dispute on normal industrial relations lines – this resulted in the ‘blacking of the site’. Aberdare Trades Council and the Action committee members picketed the entrance to the site and many lorries delivering material were turned away during those early weeks. To coincide with the picketing, a demonstration march was arranged and more than 800 people marched through Hirwaun on the 18th July, 1973. This resulted in a lot more pickets being recruited. They were mostly housewives and mothers, who later, when opposition was quite overwhelming and frightening, stuck to their posts on the picket line. “The Trades Council are doing a grand job and we are trying to join them as much as we can”, Mr Aubrey Morgan said, and he went on to pay tribute in particular to the enthusiastic leadership the Trades Council was being given by its President, Mr Roger Vallis of Cwmbach who was also proving to be a first class organiser. “The National Union of Mineworkers are also playing their part with workers at the Tower Colliery refusing to co-operate with the gas tank workers”. Perelli Ltd. also showed support by closing their works and offices for one day and marching to Hirwaun to picket. The headquarters of the picketers was an old railway carriage placed at the entrance to the site. Despite howling winds outside, the carriage gave shelter to everyone. It was heated and comfortable. Oil heaters gave off warmth and old rugs covered the floor. Cushions eased the hard bench seats of the old chapel pews. A list of trade unions pledged to support the anti-tank movement, covered both sides of the 8ft. door. On the walls inside, cuttings from newspapers adorned the walls (the anti-tank movement had a fantastic press) turning the little shed into a minute exhibition room chronicling the five year battle against the British Gas Corporations’ proposals. Not all press reports were encouraging. ‘Looking at Life’ by R. E. Porter in the Aberdare Leader published an article about the protesters, suggesting they look at their position again and have a free discussion with the Chairman of Wales Gas, with possibly a third party being involved. “Can’t they consider the assurances of the Gas Corporations’ experts that the tanks are completely safe”(Western Mail). rotas were organized to ensure there were pickets at the site entrance at all timesS. Christmas day being no exception. Reference is made in Mr Davies’ dissertation to an appeal made to the Lord Chancellor, Viscount Hailsham (Ultimate authority on law) by Captain J. Eaton Wynford Williams of Aberdare (see web site of the same name, written by his son, Roger). He spoke of his opposition to siting the gas tanks at Hirwaun where his evidence of the consequences of an explosion at the site benefited from his army experience. On the 16th August, 1973 there was a clash between pickets and an equal number of police (about 20 on both sides) as a lorry tried to enter the site. Arrests were made. A plea by residents to the newly elected Prime Minister, Harold Wilson. Newly appointed Secretary of State, Mr John Morris, asked to remove planning permission for tanks but he refuses to consider. British Gas offer to move the tanks 130 yards. An attempt to break the deadlock – Members of Hirwaun Action Committee and British Gas attend a meeting organised by Aberdare MP. Mr Ioan Evans. Mr Patrick Gallagher, Chairman of Wales Gas, 1970-1974, talks with factory chiefs on the Hirwaun Industrial Estate. British Gas start a public relations campaign but they make a huge mistake by staging an exhibition in the Aberdare Gas Showrooms when the majority of objectors were from Hirwaun. They later installed a mobile van in the centre of Hirwaun (alongside the Library) showing details of their plans but it was poorly attended as the local people no longer wanted the tanks in Hirwaun. On the 9th October, 1973, gas tank objectors were asked by the British Gas Corporation to name an alternative site. “Moral blackmail” says the Western Mail when British Gas say they have turned away 114 firms from setting up in the area and on the 14th March, 1974, British Gas announce they will cross the picket lines tomorrow. It was the moment that everyone had been waiting for. Watched by the Country’s Press the hundreds of gas tank picketers were just beginning to think that perhaps it was all going to be a damp squid as British Gas contractors had been expected at ten o’ clock. Picketers and police had taken up their positions from early light. There was a sudden restlessness in the crowd as, unexpectedly, two mini buses arrived full of burly ‘bobbies’ indicating that things had started to move and suddenly, quietly and quickly, it all happened. A khaki Landrover turned into the entrance followed by two transit vans containing workmen and Gas Board staff. They had come to start work. 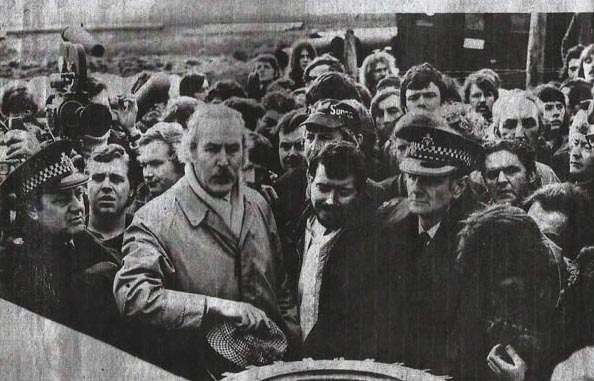 They were met by a wall of picketers and while police surrounded the Landrover, British Gas Liaison Officer, Mr Wilfred Bevan, the spokesman for the day, asked for access to the site, legally owned by the British Gas Corporation. Members of the Aberdare Trades Council and Hirwaun Action Committee denied them access asking Mr Bevan to convey to Mr Gallagher that in view of the change in Government and talks going on at the moment, between, the Secretary of State for Wales and Aberdare MP, Mr Ioan Evans, who was also making representation to the new Minister for Energy, Mr Eric Varley (1974-1975), would the token Gas Board Force withdraw at least for the week and to await the outcome of the talks. Mr Wilfred Bevan, spokesperson for the British Gas Corporation, on 15th March 1974 appearing to the pickets to allow his workmen access to the site. Mr Bevan retired, for the first time, to communicate over the radio telephone link with his superior at Cardiff. “My orders are to press on,“ he said, on return. President of Aberdare Trades Council, Mr Bryan Price, Executive members, Roger Vallis and Dr. Alistair Wilson and also the MP for Brecon and Radnor, Mr Caerwyn Roderick kept up their pleas. The exchanges were calm and reasoned – talks were going on – would the vehicles withdraw? Several times Mr Bevan returned to his van to telephone the Chairman of Wales Gas, “Why is he in Cardiff and not here”, “Bring him here”, said the officials. Each time Mr Bevan returned with the same answer “The vehicles must enter; work must start; the delay has already cost 1 million pounds”. “Then it is on your shoulders”, commented Mr Roger Vallis. There was a sudden feeling that what everyone had feared was about to become a reality. Chief Supt. F. Neal – in charge of the police – made a further plea for reasonableness. “I want no one ending up in the Police Station today – move back and let the vehicles through” A mighty united roar of “ NO “ rose from the crowd. This heralded the action. Suddenly, from down the road came the stirring sight of a small army of factory workers from the nearby Hirwaun Industrial Estate. They had been summoned secretly to lend their support. The police closed ranks with linked arms to try and keep the crowd away. Scuffling broke out and two picketers were bundled into the’ Black Maria’. The fray was obviously an unequal one. Mr. Bevan retired to his telephone yet again. He, eventually, stood on the bumper of his landrover to address the crowd. “We have decided to call it off to avoid further possible………”. but the rest of his speech was lost in cheers. Despite a few ugly moments the confrontation had been conducted in a reasonable almost dignified manner. Roger Vallis urged the protesters to disperse quickly and quietly. It had taken about an hour. The incident on the 15th March involved about 70 uniformed policemen and about 1000 protesters. Half the protesters were women and Mr Vallis explained the reason for this. The factories nearest to the site were manned by women and they were the ones who got there first when the alarm was raised. ”The women would have been pulled out and the men would have taken the brunt of the action”, he said, if the Gas Board and the contractors had persisted. Even though the preparatory work had begun, the site was closed and from then on the British Gas Corporation were never able to regain the initiative and open the site. In September 1974, Aberdare Urban District Council is threatened with a £2 million pound bill if the Secretary of State revokes planning permission for the Hirwaun site. In December, 1974 an alternative site at the Dynevor Arms is unanimously accepted by representatives of four valley councils.It is recommended to the British Gas Corporation and the Secretary of State for Wales but in January, 1975 – Wales Gas declare – HIRWAUN IS STILL THE BEST SITE. June 1975 – A deputation from the Heads of the Valleys Standing Conference meet Mr Tony Benn (Energy Secretary 1975-1976) to tell him of the alternative Dynevor Arms site. 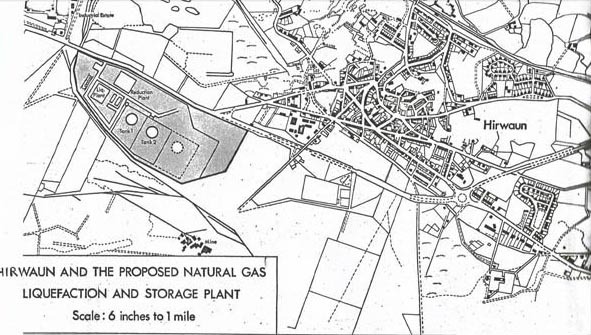 September 1975 – The Energy Minister, Mr Tony Benn, recommends that the British Gas Corporation apply for planning permission for 80 acres at the Dynevor Arms site and in December, 1975 British Gas Corporation lodge a planning application to install their ill- fated storage tank complex at the Dynevor Arms site. It was to be 1977 before the Dynevor Arms site was accepted by the British Gas Corporation and in March/April 1978 theroadworks for the gas tanks at Dynevor Arms began. The work was carried out by Mid Glamorgan County Council and paid for by the British Gas Corporation. Construction work at the Dynevor Arms site is expected to be completed by 1982. It is now estimated that the gas tanks and ancillary buildings will cost some tweny million pounds, the original estimate being about four and a half million. Ironically one of the factors favoring the Hirwaun site was the cost of developing it. Another site was ruled out partly because the cost would have been one to one and a half million pounds more. The British Gas Corporation were forced to give up their plans for Hirwaun by a well executed campaign of picketing by villagers supported by trade unions. National Grid announced its plan to dispose of the LNG storage facility at Dynevor Arms in South Wales last November, i.e. 11/2008. They were unable to sell it because of lack of buying interest and so it closed in April, 2009. The village that took on the Government and the might of the British Gas Corporation celebrated their victory in style last night (19.05.1978). In March of this year they called off 4/5 years of picketing. 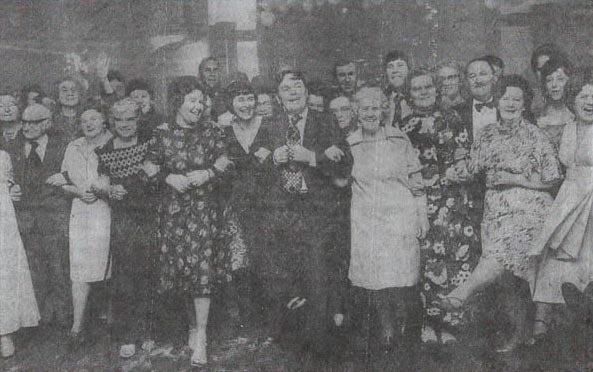 A dance and buffet was held in the local Royal British Legion Club. Among the special guests were the MP for Aberdare, Mr Ioan Evans, Brecon and Radnor MP, Mr Caerwyn Roderick, representatives of Mid Glamorgan Borough Council and the Aberdare Trades Council. Hundreds of villagers raised their glasses to Mr Aubrey Morgan, the action committee chairman and local headmaster, and to the committee’s bashful secretary, Mrs Margaret Drew. The old railway hut used by the pickets during their siege of the original site is causing something of a poser. Some want to preserve it but it might just fall to pieces if it was moved. Don’t argue just accept it. They really could not care less. And watch their future damned. The Flixborough Disaster was an explosion at a chemical plant close to the village of Flixborough, England on 1st June 1974. It killed 28 people and seriously injured 36.